Ukraine, Portugal’s Euro 2020 qualifying opponents, could see their solid start to the qualifiers wiped out with strong accusations that they fielded an ineligible player against both Portugal and Luxembourg. Junior Moraes, who played 18 minutes of the 0-0 draw against Portugal and the full 90 minutes in their 2-1 victory over Luxembourg, became a naturalised Ukrainian just days before the qualifying matches were set to take place. Andriy Shevchenko, the current Ukrainian boss, immediately called up the Brazilian-born forward for the matches as soon as his Ukranian citizenship became official. However, reports have surfaced that his presence in the team was illegal, due to FIFA rules stipulating that any player must have lived in a country for 5 uninterrupted years to be eligible for naturalisation. In total, Moraes has spent 7 years in Ukraine, although his longest consecutive stint in the country was just short of 4 years and 8 months between July 2012 and February 2017, insufficient to be granted naturalisation according to FIFA regulations. That is because he was loaned out to Chinese club TJ Quanjian for four months between February and July of 2017, breaking his consecutive years living in Ukraine. FIFA are expected to look at the case in the coming days, with a decision to be taken as to whether Ukraine should be given appropriate punishment. 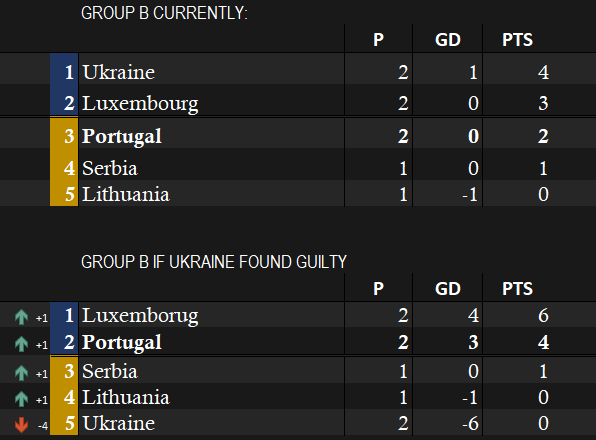 If FIFA do find them guilty of breaching regulations, Portugal and Luxembourg are expected to be awarded 3-0 victories against Ukraine, with Ukraine then dropping down to zero points. It is said that the 31-year old was awarded the Ukrainian citizenship by the country’s president by special decree, as opposed to either FIFA or UEFA ratifying the decision. The Luxermbourg president has already confirmed that they will enquire to UEFA for clarification on the supposed eligibility of Junior Moraes.